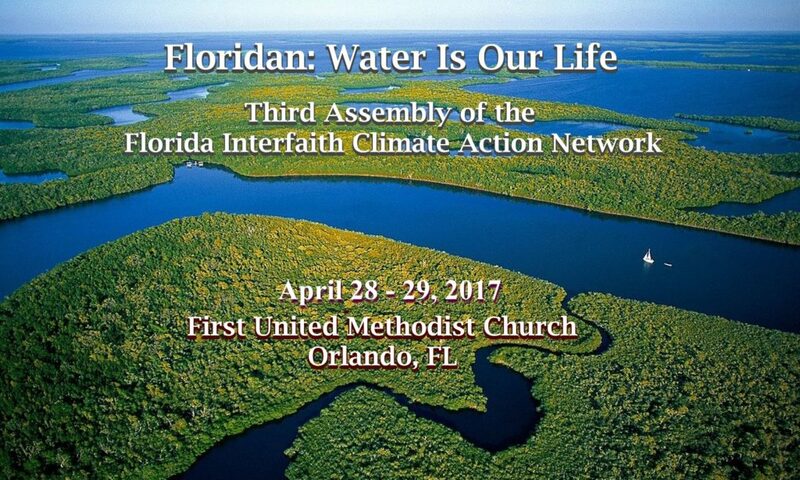 NEW DATE: The third annual Florida Interfaith Climate Action Network is scheduled for April 28, 2017, at First United Methodist Church, 142 East Jackson Street, Orlando. This year’s assembly will lift up how the theme “water is life” is reality in Florida, from the precious Floridan Aquifer to the river of grass flowing into the Everglades to the rising seas along the beaches, and the estuaries threatened by runoff and salinization, plus the growing threat of fracking. Florida development projects a population increase of 15 million people by 2070, nearly doubling the current 20 million. Florida is already experiencing water issues; imagine 35 million residents fighting for clean water. Registration is open. Sign up now.